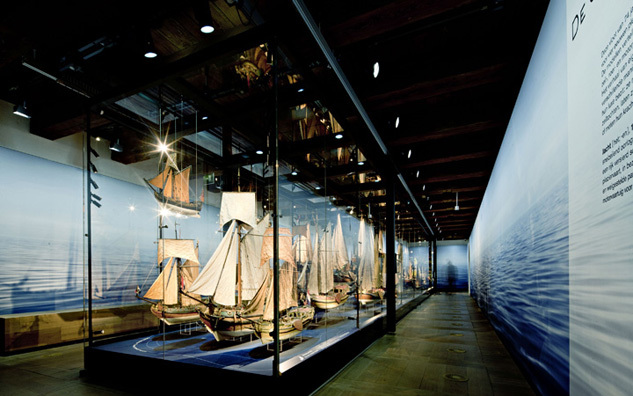 Guide: Good morning everyone, and welcome to the Maritime Museum. Now before we commence our tour I’d just like to tell you a little bit about the history of the museum As you can see, it’s a very modern building built in the post modern style and it was in fact opened by the Prime Minister of Australia in November 1991. It’s been designed with a nautical flavour in mind to remind us of our links with the sea. But the museum isn’t only housed in this building, there are a number of historic ships docked outside in the harbour which form part, of the museum and which you are also free to visit, and we’ll be coming to them shortly I’d just like to point out one or two things of general interest while we’re here. Handicapped toilets are located on this floor and the door shows a wheelchair. The cloakroom where you can hang your coat or leave your bags is just behind us here. The education centre is on the top floor and there’s a good little library in there which you might like to use. Follow the signs to the Education Centre — you’ll see a lot of little green arrows on the wall. The green arrows will take you there. The information desk, marked with the small letter i on your plan is located right here in the foyer, so if you get separated from your friends, I suggest you make your way back to the information desk because we’ll be returning to this spot at the end of the tour. All right? Now if you look out this window you should be able to see where the museum’s ships are docked. If you want to go on a tour of the old ship, the Vampire, she’s docked over there and you should meet outside on the quay. However a word of warning! I don’t recommend it for the grandmas and grandpas because there are lots of stairs to climb. Right, now, let’s move on. Oh, I almost forgot to give you the times for that tour. Now, tours of the Vampire run on the hour every hour. All right? Let’s take a walk round the museum now. The first room we’re coming to is the theatre. This room is used to screen videos of special interest and we also use it for lectures. There’s a continuous video showing today about the voyages of Captain Cook, so come back here later on if you want to learn more about Captain Cook. Now, we’re moving along the gallery known as the Leisure Gallery. This is one of our permanent exhibitions and here we try to give you an idea of the many different ways in which Australians have enjoyed their time by the sea: surfing, swimming, lifesaving clubs, that’s all very much a part of Australian culture. At the end of this section we’ll come to the Picture Gallery where we’ve got a marvellous collection of paintings all by Australian artists. I think you can buy reproductions of some of these paintings in the museum shop. Well worth a good look. Now we’re coming to the Members’ Lounge. As a member of the museum you would be entitled to use the members’ lounge for refreshments. Membership costs $50 a year or $70 for all the family. So it’s quite good value because entry to the museum is then free. wonderful collection of souvenirs from the old days when people travelled by ship. You’ll find all sorts of things there: old suitcases, ships’ crockery, first class cabins decorated in the fashion of the day. Just imagine what it must have been like to travel first class. Now I’m going to leave you to walk round the museum on your own for a while and we’ll all meet back again at the information desk in three quarters of an hour’s time. I hope you enjoy your time with us at the museum today. Thank you.